Leonard Sidney Woolf (/ˈwʊlf/; 25 November 1880 – 14 August 1969) was a British political theorist, author, publisher and civil servant, and husband of author Virginia Woolf. Woolf was born in London, the third of ten children of Solomon Rees Sidney Woolf (known as Sidney Woolf), a barrister and Queen's Counsel, and Marie (née de Jongh). His family was Jewish. After his father died in 1892 Woolf was sent to board at Arlington House School near Brighton, Sussex. From 1894 to 1899 he attended St Paul's School, and in 1899 he won a classical scholarship to Trinity College, Cambridge, where he was elected to the Cambridge Apostles. Other members included Lytton Strachey, John Maynard Keynes, G. E. Moore and E. M. Forster. Thoby Stephen, Virginia Stephen's brother, was friendly with the Apostles, though not a member himself. Woolf was awarded his BA in 1902, but stayed there for another year to study for the Civil Service examinations held then. In October 1904, Woolf moved to Ceylon (now Sri Lanka) to become a cadet in the Ceylon Civil Service, in Jaffna and later Kandy, and by August 1908 was named an assistant government agent in the Southern Province, where he administered the District of Hambantota. Woolf returned to England in May 1911 for a year's leave. Instead, however, he resigned in early 1912 and that same year married Virginia Stephen. Leonard and Virginia Woolf lived at 17 The Green Richmond starting from October 1914. In early March 1915 the couple moved to nearby Hogarth House, Paradise Road. In 1919, the Woolfs purchased the Round House in Pipe Passage, Lewes. The same year they discovered Monk’s House in nearby Rodmell, which both she and Leonard favored because of its orchard and garden. She then bought Monk’s House and sold the Round House. 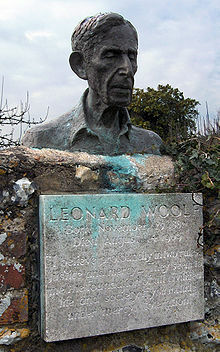 Together Leonard and Virginia Woolf became influential in the Bloomsbury Group, which also included various other former Apostles. In December 1917, Woolf became one of the co-founders of the 1917 Club, which met in Gerrard Street, Soho. After marriage, Woolf turned his hand to writing and in 1913 published his first novel, The Village in the Jungle, which is based on his years in Sri Lanka. A series of books followed at roughly two-yearly intervals. On the introduction of conscription in 1916, during the First World War, Woolf was rejected for military service on medical grounds, and turned to politics and sociology. He joined the Labour Party and the Fabian Society, and became a regular contributor to the New Statesman. In 1916 he wrote International Government, proposing an international agency to enforce world peace. As his wife's mental health worsened, Woolf devoted much of his time to caring for her (he himself suffered from depression). In 1917 the Woolfs bought a small hand-operated printing press and with it they founded the Hogarth Press. Their first project was a pamphlet, hand-printed and bound by themselves. Within ten years the Press had become a full-scale publishing house, issuing Virginia's novels, Leonard's tracts and, among other works, the first edition of T.S. Eliot's The Waste Land. Woolf continued as the main director of the Press until his death. His wife suffered from severe bouts of mental illness throughout her life, until her suicide by drowning in 1941. Later Leonard fell in love with a married artist, Trekkie Parsons. In 1919, Woolf became editor of the International Review. He also edited the international section of the Contemporary Review from 1920 to 1922. He was literary editor of The Nation and Atheneum, generally referred to simply as The Nation, from 1923 to 1930), and joint founder and editor of The Political Quarterly from 1931 to 1959), and for a time he served as secretary of the Labour Party's advisory committees on international and colonial questions. In 1960, Woolf revisited Sri Lanka and was surprised at the warmth of the welcome he received, and even the fact that he was still remembered. Woolf accepted an honorary doctorate from the then-new University of Sussex in 1964 and in 1965 he was elected a Fellow of the Royal Society of Literature. He declined the offer of Companion of Honour in the Queen's Birthday honours list in 1966. Among his nine siblings, Bella Woolf was also an author. Woolf died on 14 August 1969 from a stroke. He was cremated and his ashes were buried alongside his wife's beneath an elm tree in his beloved garden at Monk's House, Rodmell, Sussex. The tree subsequently blew down and Woolf's remains have since been marked by a bronze bust. His papers are held by the University of Sussex at Falmer. Woolf, Leonard (1960). Sowing: an autobiography of the years, 1880–1904. London: Hogarth Press. OCLC 185524636. Published in America as Woolf, Leonard (1960). Sowing: an autobiography of the years, 1880–1904 (1st American ed.). New York: Harcourt, Brace. ISBN 978-0-15-683945-7. OCLC 1346957. Also OCLC 1339821. Woolf, Leonard (1961). Growing: an autobiography of the years 1904–1911 (1st American ed.). New York: Harcourt, Brace & World. OCLC 494500. Also OCLC 21246847 (1977), OCLC 67527334 (1967), Eland (2015). Woolf, Leonard (1975) . Beginning Again: An Autobiography of the Years 1911 to 1918. Harcourt Brace Jovanovich. ISBN 978-0-15-611680-0. Woolf, Leonard (1967). Downhill all the way: an autobiography of the years 1919–1939 (1st American ed.). New York: Harcourt, Brace & World. OCLC 1065888. Woolf, Leonard (1969). The journey not the arrival matters: an autobiography of the years 1939–1969. London: Hogarth Press. ISBN 978-0-7012-0326-9. OCLC 186031338. Published in America as Woolf, Leonard (1969). The journey not the arrival matters: an autobiography of the years 1939–1969 (1st American ed.). New York: Harcourt, Brace & World. OCLC 58615. Coates, Irene (2002). Who's Afraid of Leonard Woolf? : A Case for the Sanity of Virginia Woolf. New York: Soho Press. ISBN 978-1569472941. Glendinning, Victoria (2006). Leonard Woolf: a biography. New York: Free Press. ISBN 978-0-7432-4653-8. OCLC 71779088. Edited excerpt of book available at Glendinning, Victoria (26 August 2006). "A fresh spirit". The Guardian. UK. Retrieved 9 December 2008.
Review of book with details about Leonard Woolf available at Gross, John (December 2006). "Mr. Virginia Woolf". Commentary. Archived from the original on 23 December 2008. Retrieved 9 December 2008. In 1982 a film version in Sinhala of Woolf's novel, Village in the Jungle, called Bæddegama was released. It featured Arthur C. Clarke in the role of Woolf. A film version of Michael Cunningham's 1998 Pulitzer Prize winning novel, The Hours, was released in 2002, starring Nicole Kidman as Virginia Woolf. The part of Leonard Woolf was played by Stephen Dillane. In 2005 a book titled Woolf in Ceylon was published by author Christopher Ondaatje. This is an unusual "in-the-footsteps of" book by the older brother of novelist Michael Ondaatje. Woolf, Leonard; Ritchie, Trekkie (2002). Adamson, Judith, ed. Love letters. London: Pimlico. ISBN 978-0-7126-6473-8. OCLC 49551724. Adam Smith, Janet (29 July 1995). "Obituary: Trekkie Parsons". The Independent. UK: BNET. Archived from the original on 27 April 2008. Retrieved 8 December 2008. ^ "Woolf, Leonard Sidney (WLF899LS)". A Cambridge Alumni Database. University of Cambridge. ^ "Virginia Woolf (1882-1941) and Hogarth House"
^ "Virginia’s Round House in Lewes up for sale"